Driving alone with my two canine companions for eleven hours, could not have been better. The dogs were chilled, taking an amazing nap in the back of the car. I stayed alert and the car did not falter. The awareness of His goodness freed my fears and fed my faith. Written together, the words “taste” and “see”, in the original Hebrew language mean; to perceive, experience, behold, see intellectually, live to see, to be fully aware. As we trust we must also be intentional about developing our soul awareness of God’s goodness. We must be devoted to staying engaged in the process of softening our wounded hearts and opening our minds. SEEK– To make a delicious dish, research is done first, seeking more information about the combination of spices and cooking temperatures. To seek, to “see intellectually”, to know what is the goodness of God and to understand what His promises are, is the first step toward developing the taste for God’s goodness. Praying for wisdom and discernment, followed by the study of scripture, will reveal God truths that will heighten trust leaving us with a desire for more divine connection. ENGAGE– To be intentionally aware of the presence of God. To be mindful of people, protection, and provision that God is placing in your life. To be still, to open your awareness to the presence of God in your mind and heart. A simple prayer from the psalms or a breathe prayer can slow down the chaos of thoughts and allow you to be more spiritually connected with your Father. ENJOY – The moment your taste is stimulated, relish in the savory taste of His love. Take note, take a picture, pause, imbibe in the moment. There is no joy like the realization that God cares, He is there, He sees, He loves unconditionally…We are free from the confines of our fears. 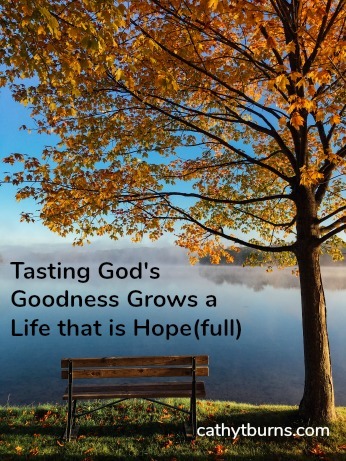 Tasting God’s goodness grows a life that is hope(full). We become hope(full) hearted living as someone that can say “I have this hope In the depth of my soul”. Your heart is the essence of who you are, your identity, it determines your perspective of life. A heart full of hope, a confident trust, in God’s goodness will have an awareness of His presence. An awareness that will change your perspective allowing you to see yourself and others with eyes love and compassion. I am going forward in this new place, two states away, hope(full) hearted. God has become my place of peace and source of joy. Prayers have been answered guiding our church planting team in God’s direction. Some days I do focus on the hurt(full) moments of loss and lose my footing a bit. My good God is patient and forgiving as I take one day at a time. I pray that God, the source of hope, will fill you completely with joy and peace because you trust in Him. Please listen to the song I Have this Hope and live in the joy of His goodness.